Which, you know, might not be a bad thing. This is Momotaro, whose owner is telling the feline to "stand." In the video, you can hear the owner praise the cat, saying, "You look like a human." 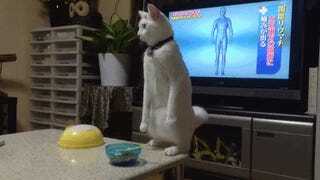 Of course, this isn't the only standing cat on the internet (this one right here might be the most famous). This might take some time, though.